Masti Gate is one of the thirteen gates of the Walled City of Lahore which were built by the Mughal Emperor Akbar. The structure of the gate is not existing now, but the grandeur of the monuments and culture still lives inside the deceased structure. 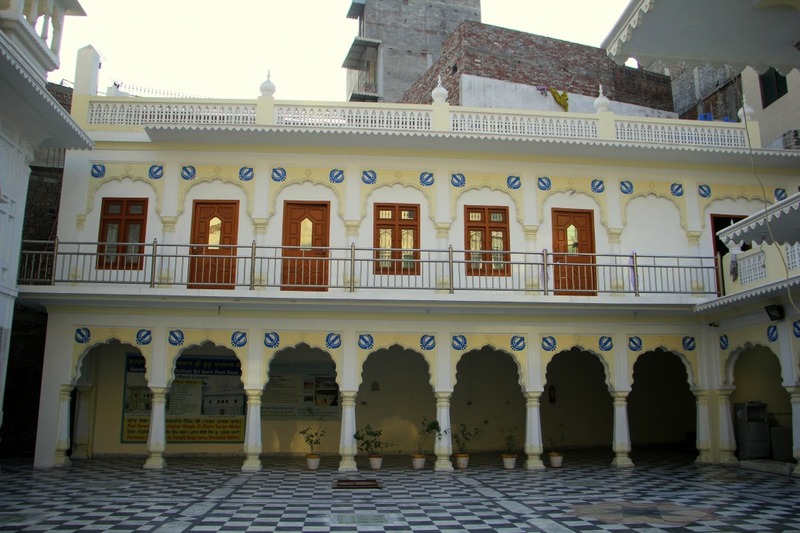 As we enter the Masti gate, a few yards from the Chunna Mandi Girls College, also known as Haveli of Jamaadar Khushhaal Singh, we see the Janam Asthan (Birth Place) of the fourth Sikh Guru Ram Das. Guru Arjun Ram Das had spent the first seven years of his life at this very place. In the history books it is mentioned that the ancestral house of the Guru Arjun Ram Das was small in size. When Maharaja Kharak Singh was born, during the birth celebration, Maharani Nakain requested Maharaja Ranjit Singh to rebuild that historical place. Agreeing upon the humble request, the Maharaja purchased the surrounding land and got a Gurudwara constructed which was somewhat similar to the Hari mandir Sahib, Amritsar. It is said in Sikh History that at the time of partition eighteen Sikhs faced martyrdom there. By all Sikh accounts, Guru’s date of birth was 24 September 1534. His parents Har Das and Daya Vati were known for their honest and pious living. Ram Das was popularly addressed as Jetha, being the first-born of his parents (Sanskrit word Jayeshth means the first). Sikh history tells us that he was of fair complexion, handsome figure, pleasing and smiling face and not disposed to weeping or crying in the manner of ordinary children. From the beginning his attitude was worldly, and he felt happiest to be in the company of holy and pious people. The city of Amritsar was established by this Guru. He was not only a city planner but was also a poet. He composed 679 hymns in varying musical measures, which were incorporated into Adi Granth by his son and successor, Guru Arjun Dev. His entire life was the embodiment of love, devotion and dedication, which is reflected in his writings. Let me take you to the Gurudwara now. From a narrow gateway you will have to climb several steps to reach the Gurudwara. It is slightly raised from the ground level. It is built in white marble and decorated with pietra dura work which was a tradition of beautifying the places in old times. It was one of the expensive mediums of structure décor. On the west of the building is an open yard and Nishan Sahib is fixed on the south-west corner. The place is wonderfully decorated and embellishments on the ceilings and walls are amazing. You will find a lot of pigeons there. Before you enter the main hall, you would have to go for ablution. The place for the same is constructed in one corner of the building. Like all other Sikh religious places in Pakistan, this Gurudwara is also with the Evacuee Trust Department of Government of Punjab. Every year thousands of Sikh Yatrees come and visit this place, and may be this is one reason that it is still preserved and in safe hands. The Granth (holy book of Sikhs) is also placed in the main hall and holy recitation is carried out daily. There are prayer timings during which the Granth is being read. The good news is that the guided tours to this Gurdawara have also been started by the Walled City of Lahore Authority. Local and foreign tourists can also visit the place anytime, but with prior booking. The walled city of Lahore is full of such places, the other Gurudwaras can be found in places like Chohatta Mufti Bakir, Mochi Gate, Bhatti Gate and Rang Mehal Chowk. Some of these are not functional but the two main are the Janam Asthan of Guru Arjun Ram Das and the Samadhi of Ranjeet Singh. These two Gurudwaras are well kept and up to the mark. The monument falls on the second part of the Royal Trail that starts from Delhi Gate and ends at Masti Gate. If you want to avoid a long walk then you must access it from the Masti Gate near Mariam Zamani Mosque. This patch is also being restored by the Walled City of Lahore Authority and I am hopeful that in near future there will be proper signages and entrance to this Gururdwara as well. There are many encroachments around it which will surely be removed during the restoration works. If you wish to visit the site you can always avail a guided tour as it is now opened for the local tourists. This is a good step taken by the Evacuee Property Trust Board.